May you and yours enjoy the blessings of the season. Thank you for the gift of your friendship, my friends! Thank you! I hope your holiday has been joyous! 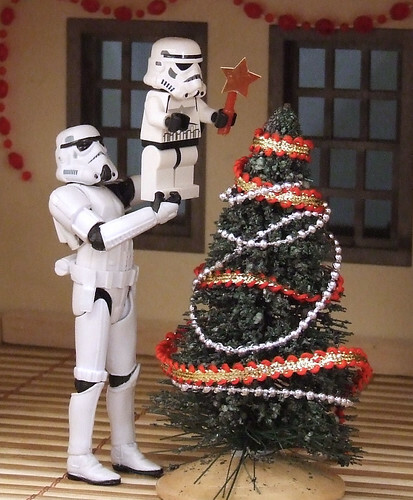 Should have been a death star on the treetop! ha ha, that's too cool. A very happy holiday to you and a fantastic 2016! Thank you so much, my friend! And to you, too! Hey, just wondering if you've looked at the book I sent you.....would love to know your thoughts! Oh my goodness, your book is beautiful. I was so touched by what I read. I remember "Of Battle & Bairns" and "Farewell" in particular followed me around a long time after reading them. You really "get" the hero's journey. But this also touches on a New Year's resolution of mine, because shortly after receiving you book, I faced Force Friday and a whole bucket of new Star Wars books I needed to read for my lectures, and I was drawn away. I intend to read your work cover to cover as the new year begins, so I can leave it a properly glowing recommendation on Goodreads. Thanks for your patience with me! No 'patience' involved. You are super busy. But I did want to send you the book - you've been kind and supportive to me, and wanted you to see this first 'child'. So glad that you have read and enjoyed and will look forward to any additional comments you care to make (and the review on Good Reads). I love it when people tell me what resonates with them.....it's always something different for everyone. (there were a great many who did not, for instance, like "Of Battles and Bairns", so it feels good that you did! Thank you) All the variances of response from readers make writing a real joy! Aw, thank you! And to you, too! Lol, cute. Hope you have a joyous and Merry Christmas! Merry Christmas to you too - and thank you for brightening my flist! I don't comment often, but I've been here reading and enjoying all year! Thanks so much - and right back at you! I've basically been sick all holiday long, so I haven't been able to keep up with all of the goodness at discoveredinalj and your blog, but I'll catch up. Thank you for all of the lovely things you share and make possible!